125687, Branded #419MM769". It measures 2-1/2"
This is a duplicate entry. 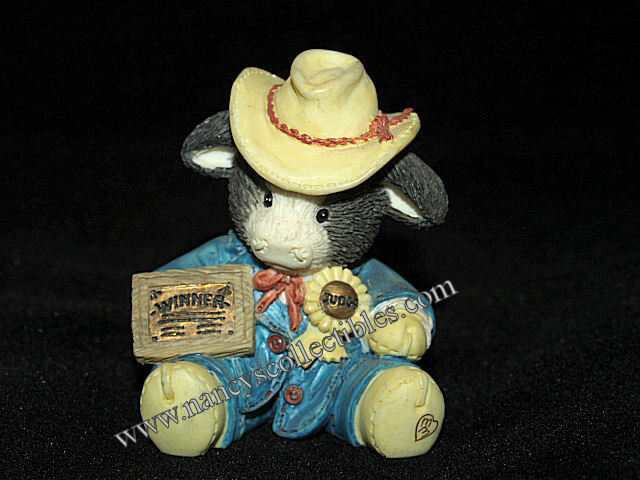 You will also find this item in "Enesco". "Judge" button on his blue jacket, blue pants and a red tie. sures 2-3/4" tall, 2" wide. head. She is holding a bouquet of yellow and white daisies. sures 3" tall, 2" wide. #034MM541". It measures 2-1/4" tall, 2-1/2" wide. 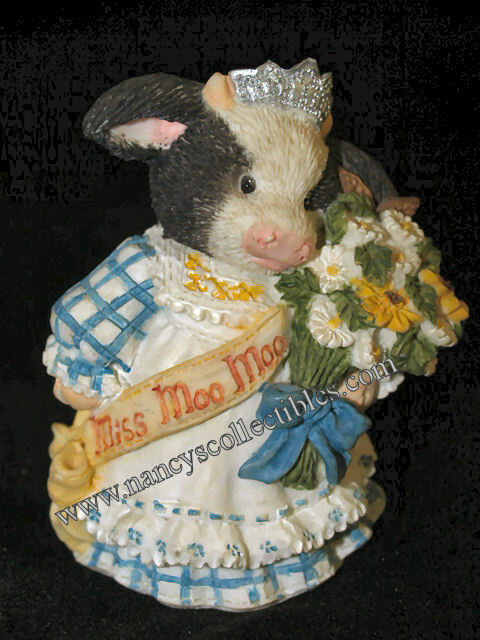 "MAY ALL MOOS DREAMS COME TRUE"
by Enesco. It is a cow holding three stars above her head. No.96MM113, 543233". It measures 3-3/4" tall, 3" wide. condition; no chips, cracks, or repairs. It is marked "MM". It measures 1-1/2" tall, 1" wide. 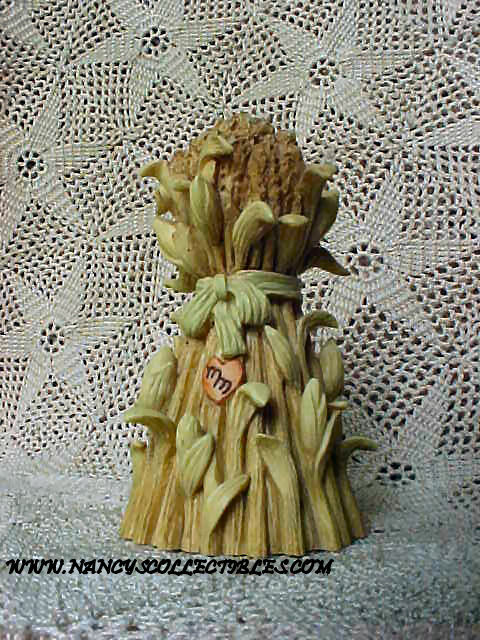 "I LOVE YOU A BUSHEL AND A PECK"
sures 2" tall, 2" wide. number is #92MM421. It measures 3-1/2"tall, 2" wide. 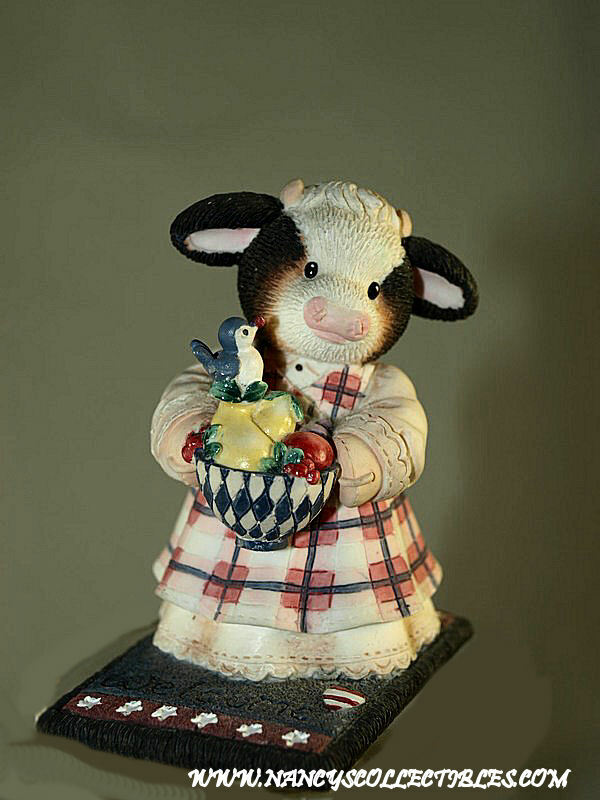 "I'M IN LOVE WITH MOO"
This is a Mary's Moo Moos figurine by Enesco. cellent condition; no chips, cracks, or repairs. 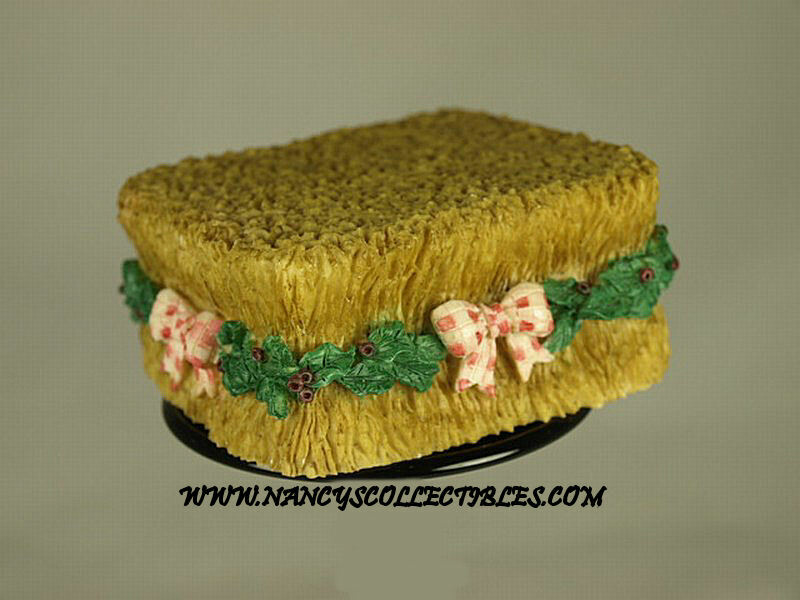 You will also find this item in "Holidays/St. 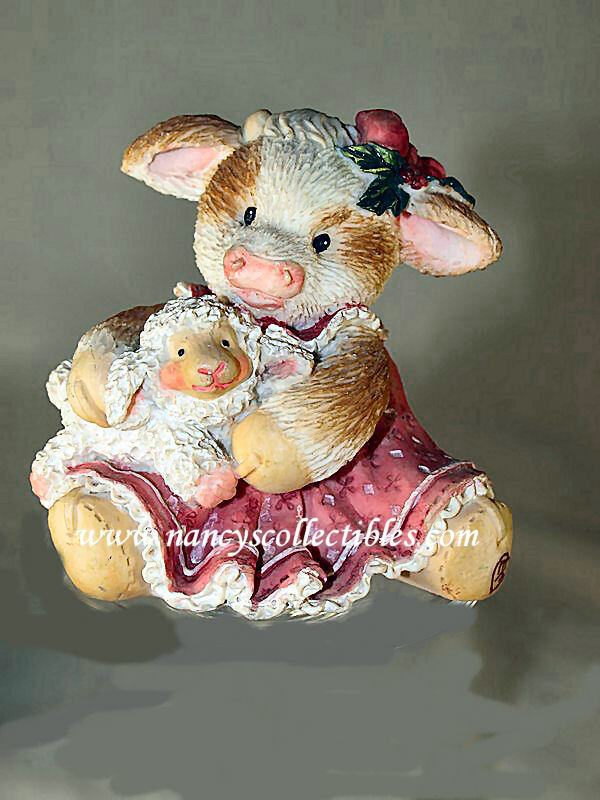 Valentine's Day" and "Enesco". 104736". 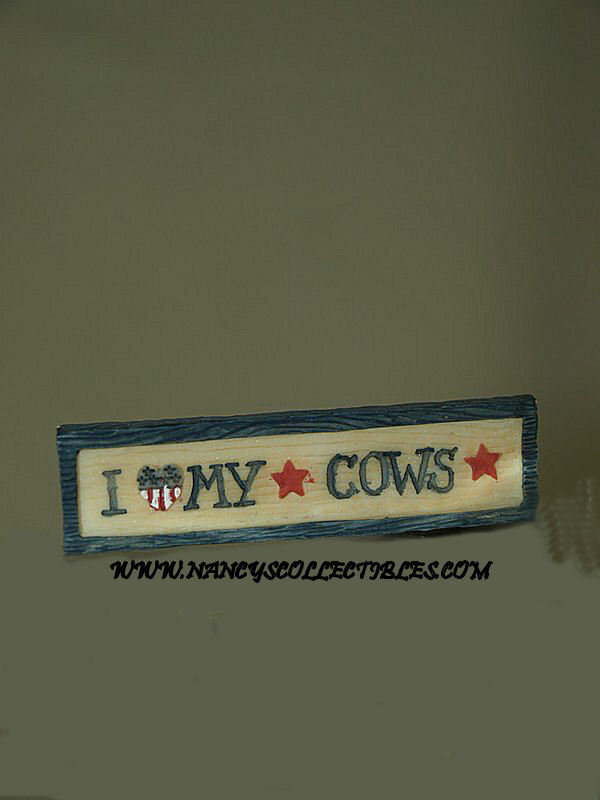 It measures 2-1/4" tall, 1-1/2" wide. 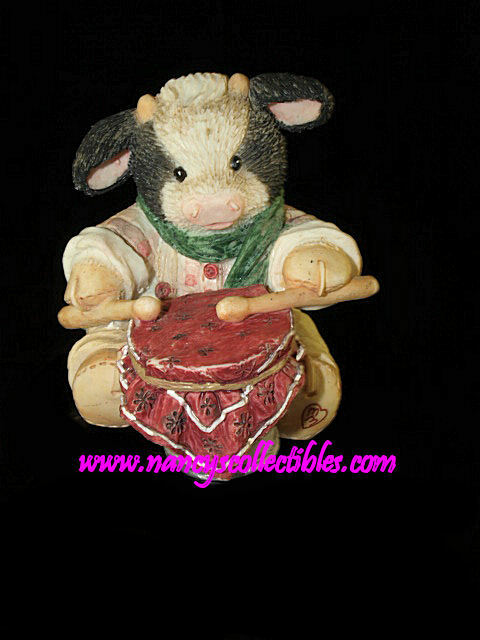 You will also find this item in "Enesco" and "Holidays/Christmas". wearing a straw-looking hat, blue dress, and yellow apron. 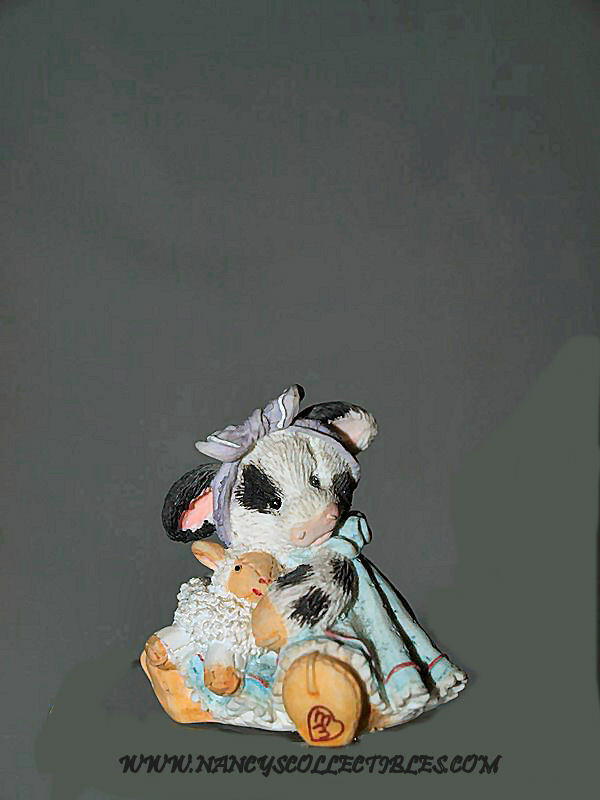 "MOO MOO HAD A LITTLE LAMB"
lace. She has a lilac bow tied around her head. Designed by Mary Rhyner, 104914". It measures 2"
orders of multiples, email me! "HERD IT FROM AN ANGEL"
in excellent condition; no chips, cracks, or repairs. Designed by Mary Rhyner, 651656. Branded #417MM436". 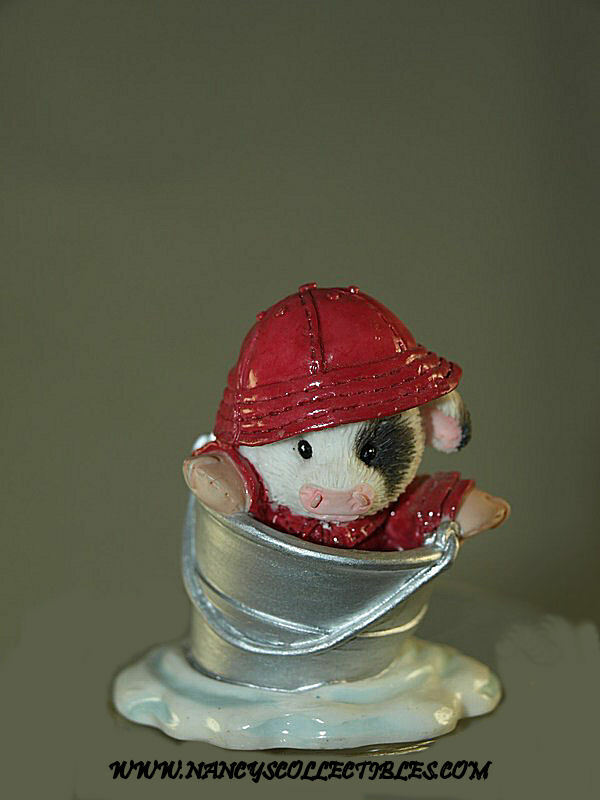 It measures 2-1/2" tall, 2-1/2" wide. 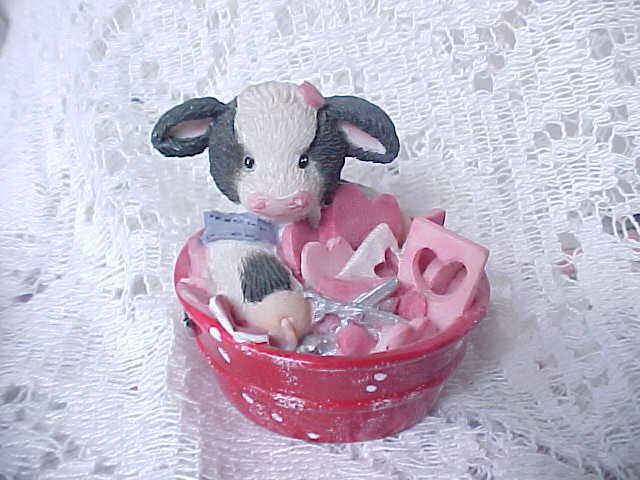 "BABY COW WITH CANDY CANE"
Enesco, 651230". It measures 2-1/2" tall. 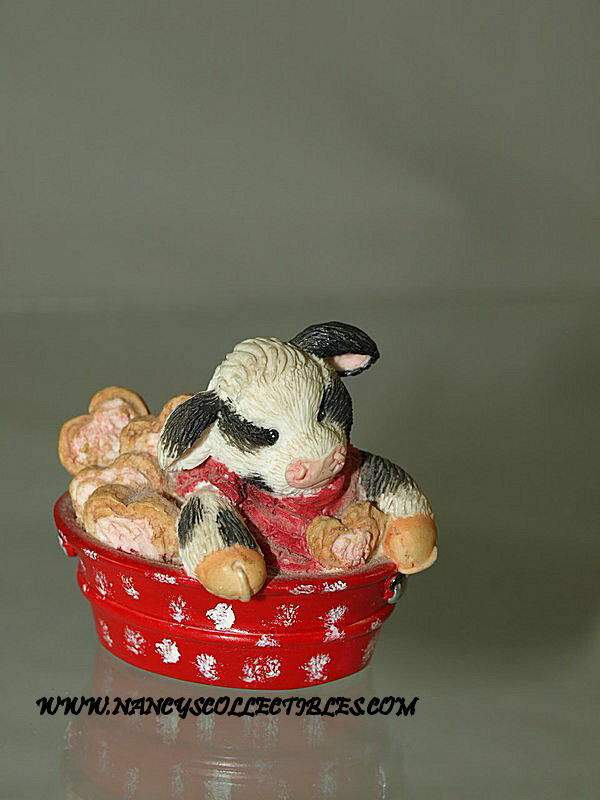 You will also find this item in "Holidays/Christmas" and "Enesco". playing a drum made from a red cloth-covered bucket. 207136". It measures 2-3/4" tall, 2-3/4" wide. 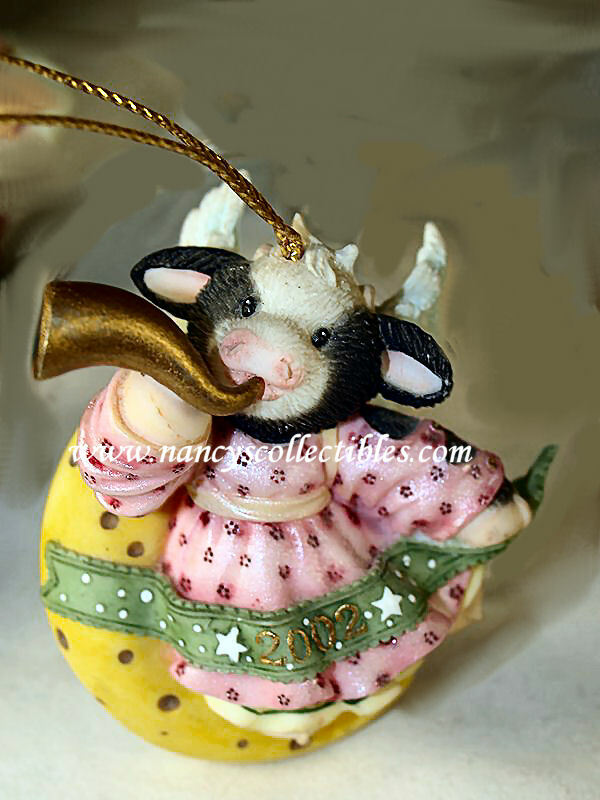 This is a Mary's Moo Moos ornament by Enesco. nament. 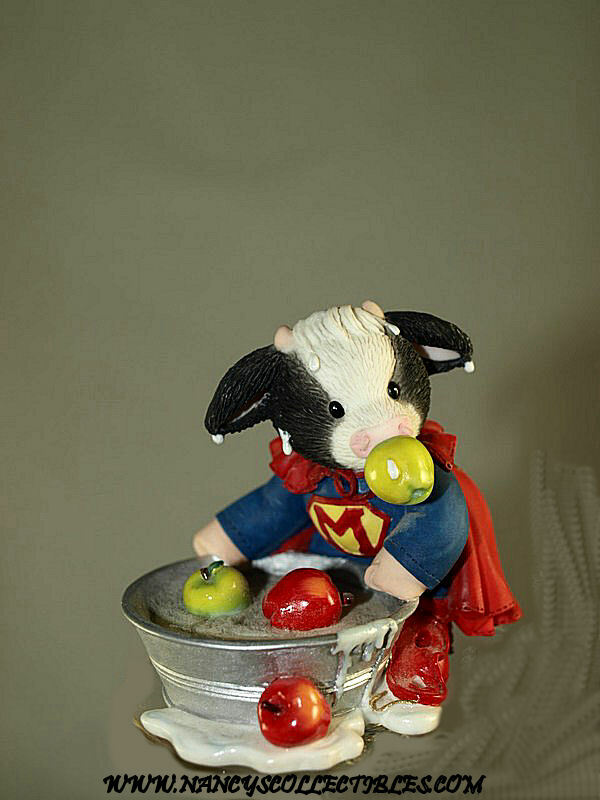 He is holding a heart with "I Love Moo"
"ECMary". It measures 1-1/2" tall, 1-3/4" wide. marked "MM". 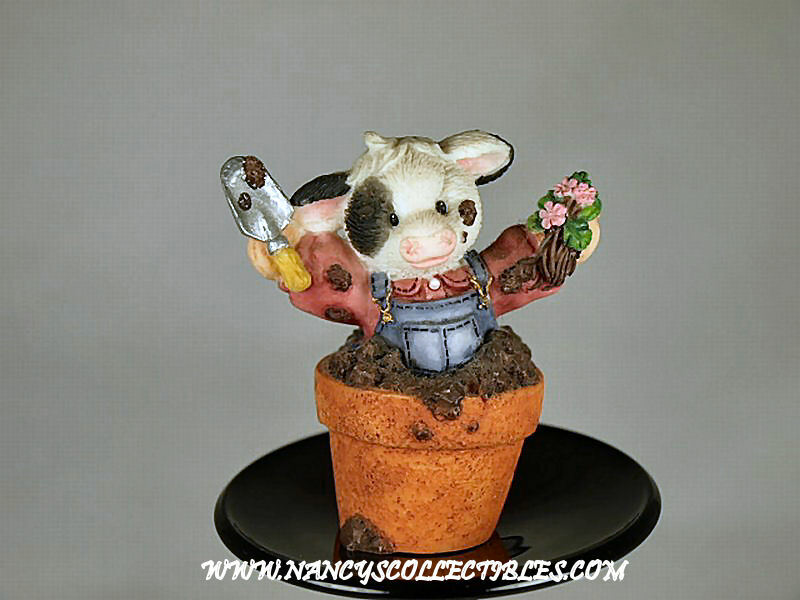 It measures 1-1/2" tall, 1-1/2" wide. sures 2-1/2" tall, 2" wide. 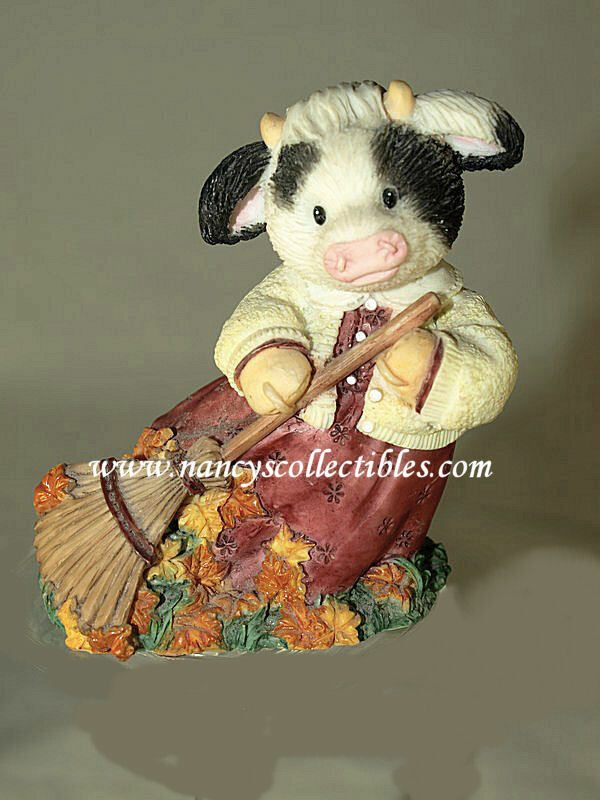 "OCTOBER - I'M TEMPTING MOO"
"NOVEMBER - MOO AUTUMN BE IN PICTURES"
a cow dressed in a white sweater over a mauve dress. She is raking the autumn leaves of yellow and orange. 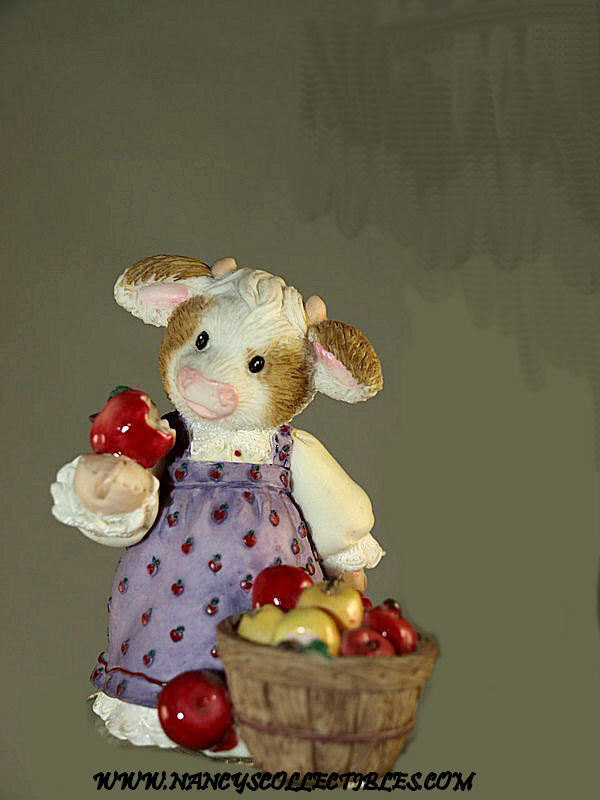 You will also find this item in "Enesco" and "Thanksgiving". blue tights with a "M" on the front, and red boots. measures 2-1/2" tall, 3" wide. 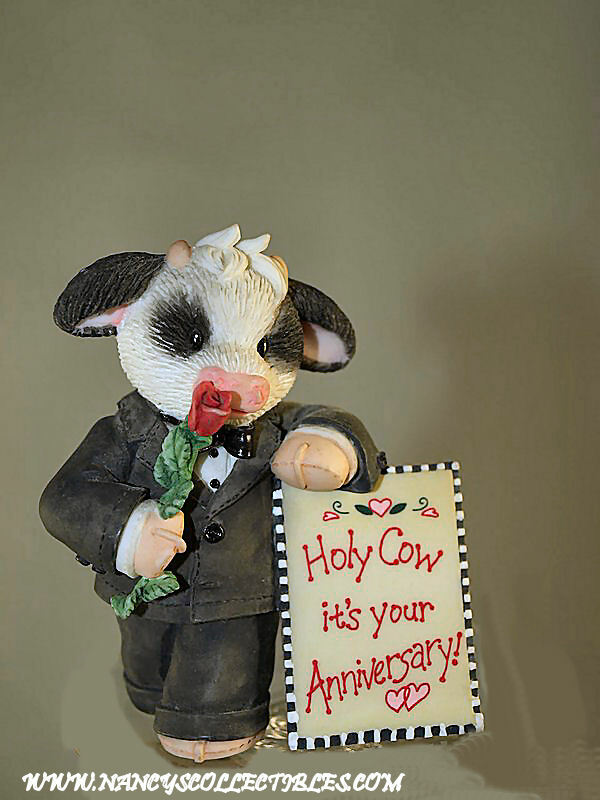 "HOLY COW IT'S YOUR ANNIVERSARY!" 2000,749591". It measures 3" tall, 2-1/2" wide. It measures 3" tall, 2" wide. number is #72MM132. It measures 3-1/2" tall, 2" wide. 296848". The Branded number is #71MM962. It measures 3"
Mary Rhyner-Nadig,296880". 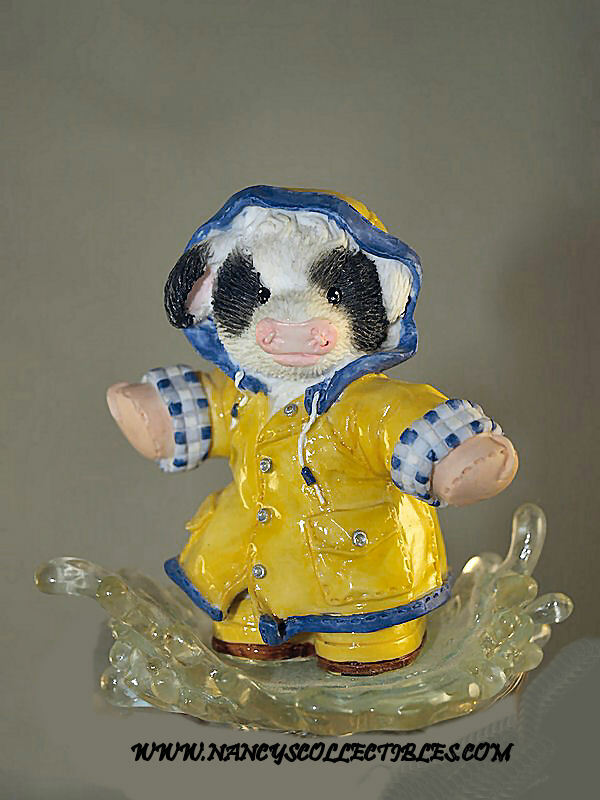 It measures 2" tall, 2"
cracks, or repairs. It is unmarked.It measures 1/2" tall, 2"
cracks, or repairs. 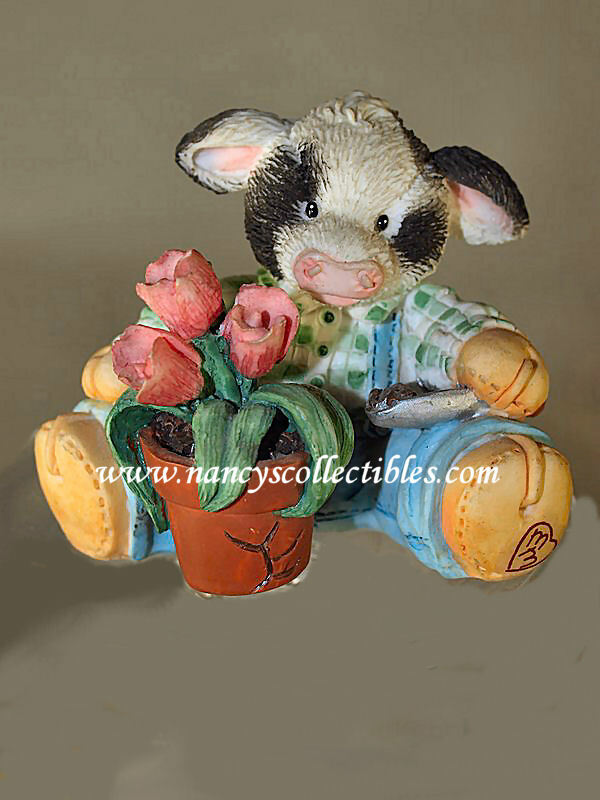 It is marked "1999, Enesco, by Mary Rhyner. It measures 1-1/4" tall, 1-1/4" wide. for this piece is 143049. 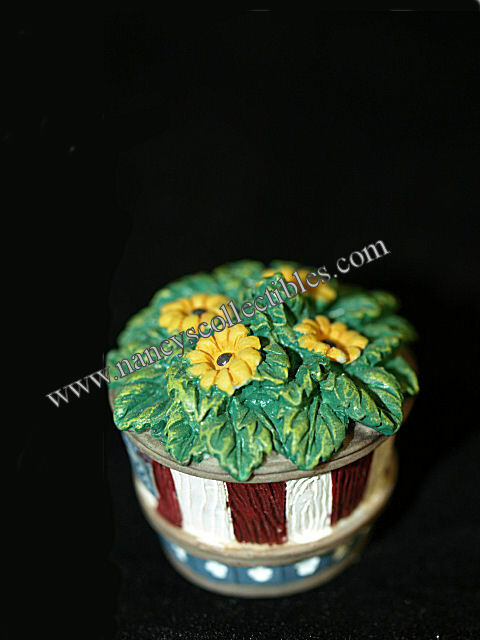 It measures 1-1/4" tall, 2-3/4"
1-3/4" in diameter at the base. 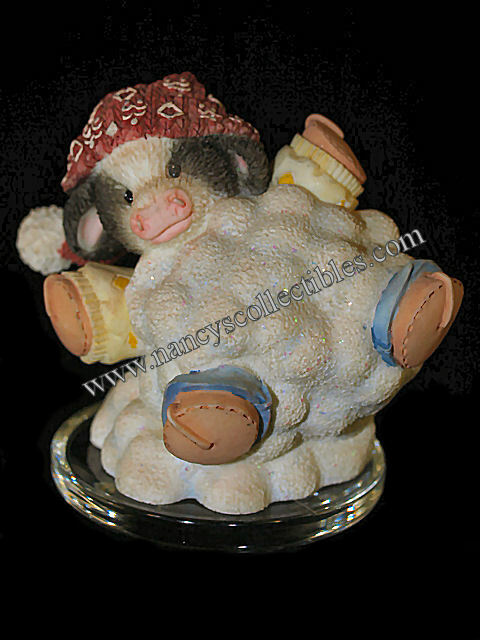 You will also find this item in "Holidays/Thanksgiving" and "Enesco". 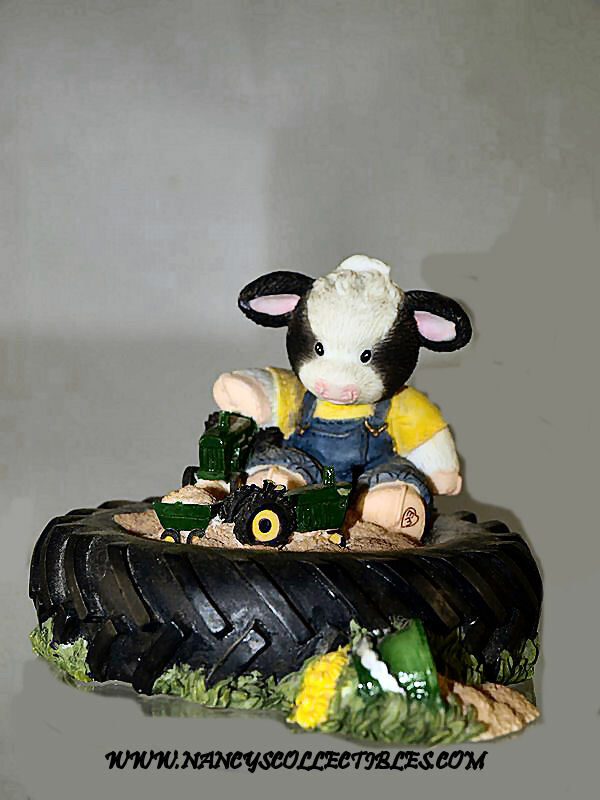 "NEVER BE TOO TIRED FOR SOME FUN"
It measures 3" tall;4-1/2" wide.